I’ve been practicing yoga daily since 2005 – if you ask my older sister she says since I was crawling. I call my style of yoga Shanti Vinyasa (peaceful flow) Inner Peace Yoga from the Heart. It’s a Hatha Yoga blend of alignment, flow, and therapeutic yoga* for injury or illness. I teach private and corporate clients, workshops and continuing education classes for yoga teachers. My group class and event schedules are listed on my class calendar and signup page. As a former lead teacher at the Lotus Pond Center for Yoga and Health (where I received my 500 hour certification) I occasionally offer certification classes, and specialized training on the pelvic floor, feet, osteoporosis, ageless agility, working with yoga straps and various other workshops. Sign up for my newsletter to see when & where I will be offering these teachings. Local studios interested in me leading any of these programs please contact me. My hope is that through my teachings students will discover inner peace they can take with them off the mat. The stresses of life are more manageable and going with the flow of life more joyful with the exploration of yoga asana (yoga postures), and pranayama (breath work), as well as meditation practices including Yoga Nidra. Strength, well-being, and moving toward balance in an unbalanced world is what I want students to find, as well as learning to trust the Self. When I teach I know I have the strong lineage of wonderful teachers with me during each session, allowing me to open my heart and teach safe yoga from there. Aromatherapy is offered in each class I teach. I will always remain a student of Yoga, keeping my mind open and aware to the teachings that surround me every moment of the day. 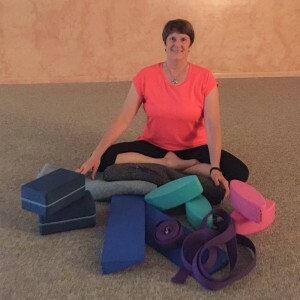 *Yoga therapy components of Nancy’s instruction are based on the over 2500 hours of specialty trainings with renowned physicians and specialists in their fields of expertise, not derived from her status as an RYT with Yoga Alliance Registry.